RawTherapee appeals to semi-pro or amateur photographers by its ability to process RAW files, i.e. the export format of photos taken on digital cameras such as SLR cameras. It is thanks to its functionalities that it has been able to carve out a place for itself in the landscape of photo editing software, dominated by Photoshop and its variations. The RawTherapee interface is reminiscent of other products of this kind: Various windows compose the screen, each frame hosting either tabs, a preview pane, or the image itself. 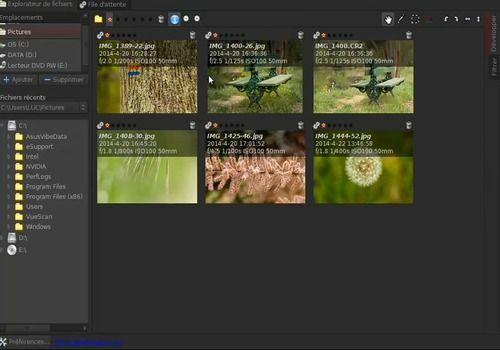 The software allows to process several image formats, including the famous RAW, but not only, which makes it a suitable software even for beginners who are not familiar with such a tool. The software is able to edit photos, retrieved directly from the AFN memory, or from a folder on the computer. The first skimming job is done at this time, on all the thumbnails or on a case-by-case basis. A first adjustment job can also be performed in vignetting mode, for example to correct underexposed or noise-filled images. Instead, the photo retouching itself is done in a complete display window, where it will be possible to influence all settings and modify some elements of the image. The modified curves can be applied to other photos. Finally, outputting the file in the desired format (PNG, JPG or TIFF) is also an opportunity to classify and rename the image (or images). Finally, and this is to be taken into account, the program does not weigh much and continues to be among librarians proof that a well executed software can hold the bag high to commercial products, and even to its great rival. Ashampoo Photo Optimizer 7 is a software that improves the aesthetics of a photo automatically or manually. It has various tools that help the user to make an image more beautiful.